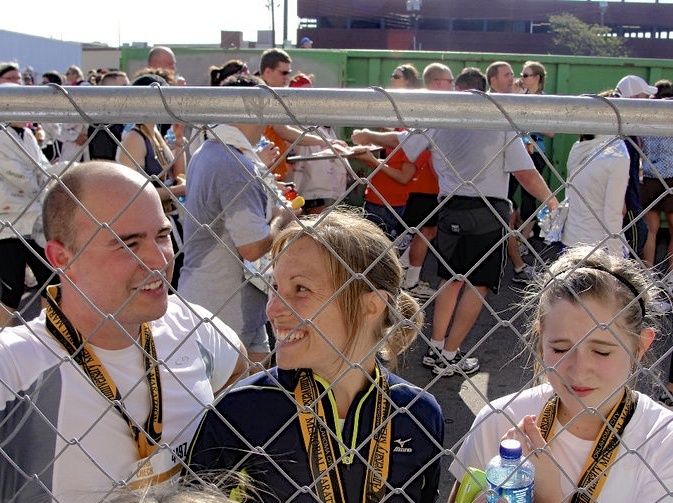 In April, I will be running in the Oklahoma City Half Marathon with my sister Jill. This will be the fourth year that we have participated. The first year we ran the race was her freshman year in High School and now she is a senior!!!! Valedictorian too! Now that I live over 5 hours away and do not get to visit as often I would like, running in a long race with her is good quality time together…you know running in rain and sleet, loosing toe nails…the typical sisterly bonding type of stuff. You can see in the picture below how much she enjoys our yearly tradition of running 13.2 miles for fun! She is so lucky to have me, right? RIGHT???? April is creeping up fast and my training schedule is beginning to ramp up. I do CrossFit at least 3 times per week, 1 small run mid-week, and 1 long run on the weekend. This means I need quick and nourishing meals throughout the week that provide nutrients to fuel and refuel my training schedule. Long endurance training sessions (60-90+ minutes) cause inflammation and deplete our bodies of stored glycogen. My old refueling routine was through breads, pasta, pancakes, and pizza…but NO MORE. This will be my first endurance event to do while maintaining a strict Paleo lifestyle. So, I am refueling with healthy fats, eating grass-fed protein, and incorporating plenty of whole foods and vegetables that contain complex carbohydrates: sweet potatoes, butternut squash, and other winter squash. I whipped up this Curried Chicken and Butternut Squash soup last weekend after I finished a cold 8 mile run. It warmed my frozen fingers and buns. This soup was the perfect recovery meal full of muscle-building protein and glycogen-restoring butternut squash. I used leftover shredded chicken from a roasted chicken that I had made earlier in the week. Another perk of this meal is that this soup is easy on the pocket-book and nourishes your family. It also freezes well! Feeding your family healthy and unprocessed meals can add up, but it is important. My money-saving tip of the week is to buy whole organic free range chickens rather than chicken parts. This will save you at least $3 bucks PER POUND. Roast or poach the whole chicken, then shred the chicken for using later in multiple meals. Wait…..DON’T THROW THAT CHICKEN CARCASS AWAY! Throw it in a crockpot on low with water and some onions, carrots, celery…whatever and make homemade chicken stock overnight as described here. I’m not afraid to admit that I have actually taken a chicken carcass home (not for voodoo) from a friend’s house to specifically make chicken stock. Should I be afraid to admit this? Maaaaybe…but, folks, I am also the gal that proudly carries around a coupon book….so I am not ashamed. I stand proud…with lots of change in my pocket! And a full belly filled with healthy restoring soup. Mmmm! In a heavy stockpot or dutch oven, heat coconut oil over medium heat. Add onions, stirring often, and sauté until translucent (about 5 to 10 minutes). Add garlic, bell pepper, curry powder, and butternut squash and cook for another 5 minutes, stirring often so that the mixture does not burn. Once the vegetables start to soften a bit, add the broth. Bring to a boil. Add chicken. Lower heat and simmer covered for 15 to 20 minutes, or until chicken is cooked through and squash is tender when pierced with a fork. 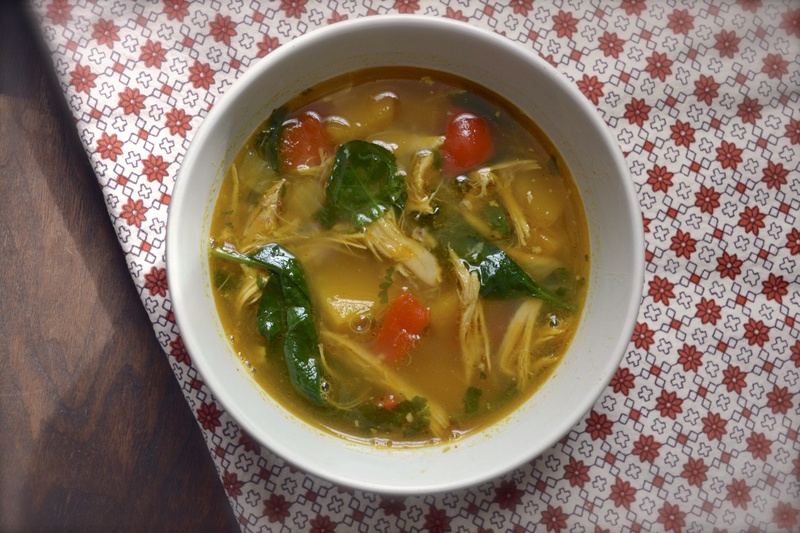 If you added whole chicken breasts or thighs, remove them from the soup and place them on a cutting board. Let them cool slightly (about 5 minutes). Shred the chicken using either your hands or two forks. Add the shredded chicken back to the soup. Add spinach and cilantro. Cook for about 3 minutes, or until the spinach becomes wilted. Serve with additional cilantro. 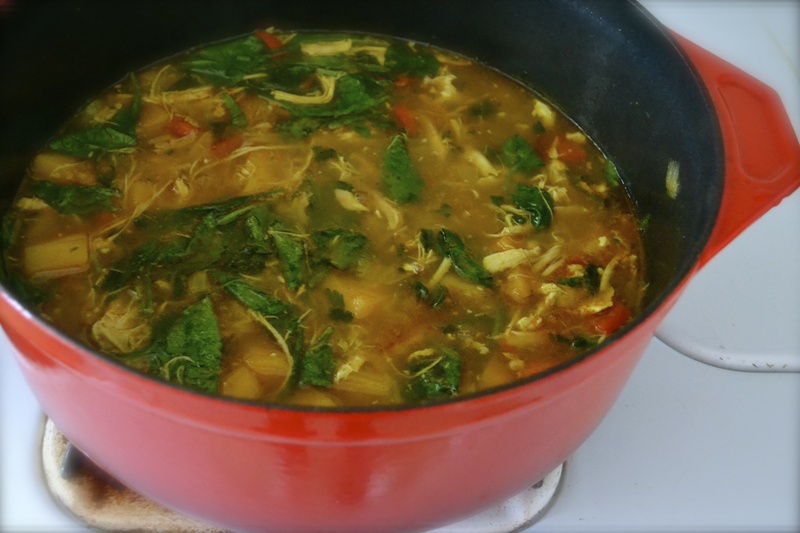 The first time I saw a high school friend cook a chicken carcas I couldn’t believe it… soup came from a can along with vegetables and just about everything in our family kitchen. Who knew? A pressure cook breaks that carcas down in less time for mr these days. I enjoy reading about your fun sisterly run. Best of luck! I need to invest in a good pressure cooker! Yum! That soup is beautiful! Maybe that’s what the lady on the subway was doing with a chicken carcass under her sweatshirt…about to make stock! This looks great – can’t wait to make it! Hahaha…ya! She was thrifty…not crazy.